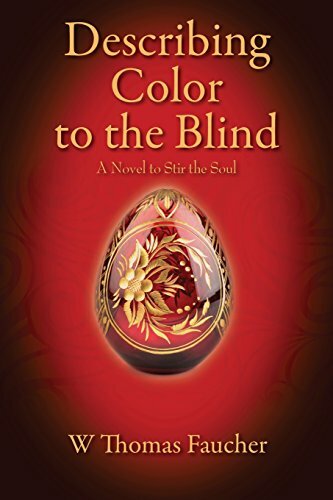 In “Describing Color to the Blind,” W. Thomas Faucher has written an excellent book that will challenge readers to view their own beliefs, their virtue, and their relationship with God. Prissy Duke is an eccentric, on-a-mission type of woman whose goal is to help others take a deep look within themselves and find the truth. She can be abrasive, yet kind when she thinks she needs to be. As a young child, Prissy was subjected to mental, physical, and emotional abuse. Her sisters were the object of sexual abuse by her father and her mother was mean, cruel, and emotionally cold. As the result of this abuse, she found herself sold to a man she didn’t know, when her dad lost a card game and traded her for a non-existing mule. Throughout her life, Prissy did what she had to do to survive which included having babies at a very young age and participating in prostitution. In comes David, a reporter from a well-known newspaper, with the task of interviewing visionaries. Initially he thinks that this will be an easy job and will make some money, which he desperately needs. Little does he know he will come to love-hate Prissy, and question his own life as Prissy challenges him. Prissy sees her mission as helping others find truth in their lives and how it impacts them. She doesn’t come right out and tell people what she thinks, instead she uses colors and food to describe them. The colors she talks about reflect good, bad, sad, evil and confusion. She believes that people write their own stories, some good some bad and the original authors of our life are our parents, and people who come into our lives. The author describes Prissy as a reflecting pool, meaning that Prissy makes people look back at themselves and often don’t like someone because they don’t like something about themselves and blame others. "Describing Color to the Blind," by W. Thomas Faucher is a book that takes time to read and process, will challenge readers, and is one you can’t put down. What will you do after you finish reading this?